From the large wrap-around screened-in balcony of this beautiful corner unit enjoy breathtaking views of the pool, islands, and Sanibel, Florida. 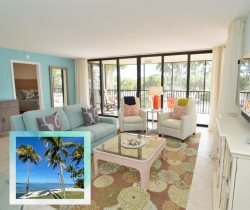 Our FL vacation rentals in Sanibel Harbour feature comfortable lounge seating on the balcony to watch sunsets. The unit contains newer appliances, carpet, freshly painted, furniture, and accessories. There's a Tommy Bahama feel to our Sanibel Harbour, FL vacation rentals, with well-coordinated, bamboo blinds for sliding doors. Wide screen TV in master. Desk in living room. Queen bed in the master, two twins in the guest bedroom and a sleeper sofa in the living room. You may have found this rental on HomeAway 4363838, HA ID 4363838, VRBO 4363838, or Vacation Rentals 4363838. We loved our stay in Bay View Tower Unit 731! The condo was immbecibly maintained, very clean, and had all of the necessary amenities. We loved the style of the unit and the great Jimmy Buffett memorabilia. Will definitely stay here again and recommend to friends. Condo was beautifully decorated and had a gorgeous view...breathtaking sunsets. Plenty of seating for entertaining friends and family and a very comfortable home away from home. We'll be back! This is our third time renting a condo at Sanibel Harbour. We look forward to coming back again next year. There's one suggestion I would like to pass on to you. We spend a lot of time going to the different beaches and always end up buying some beach chairs and an umbrella to take. We try to pass them on to new guests when they arrive, but it would be quite helpful if you offered some beach rentals at the unit or office. ........................................................................................... Resort Harbour Properties June 6, 2016: Thank you for taking the time to share your experience and feedback. We do work with Happy Baby Rentals who delivery and pick up vacation rental equipment including baby cribs, joggers, car seats to beach chairs, unbrella's, coolers, and more. Their full inventory can be viewed at HappyBabyRentals.com. Staff was very helpful with printing boarding passes for the trip home. We have stayed at Sanibel Harbour Resort Properties 6 times over the past 15 years and we are always pleased with the quality of the condo units, the amenities, and the great staff. We will definitely be back!